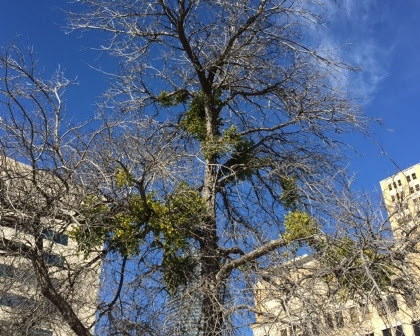 Trees with mistletoe are in stress. Trees with heavy populations of the parasite are seriously in stress. But there is a solution and this is the perfect time to apply the procedure that will solve the problem. Here's the control plan. Prune all the mistletoe out of the tree. It can be put in the compost or chopped up and sprinkled on fire ant mounds. Remove infested limbs completely if it can be done without ruining the shape of the tree. Notch into large limbs that can't be removed. I used to say that this is the only place I recommend the use of pruning paint. That was a dumb recommendation. Pruning paint and toxic wound dressings should never be used. At the most, slather a little Tree Trunk Goop on the wound. Next apply the Sick Tree Treatment with the first step (and most important one) being the exposure of the trunk flare. All soil and mulch should be removed from the flare. It has been reported to us that the mere application of dry molasses will cause the mistletoe to fade out, but the entire procedure is the better way to go, plus it will help with issues other than parasites.